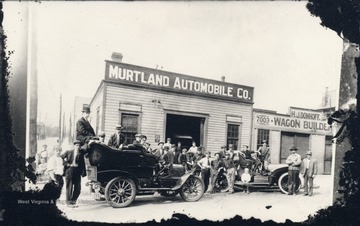 Exterior of Murtland Automobile Company; people and automobiles are in front; also includes storefront of "H.J. Domhoff, Wagon Builder." 2. 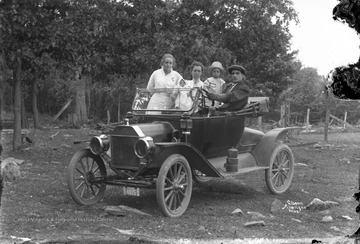 Family in Automobile, Albright, W. Va.
Family in Automobile, Albright, W. Va.
Shay train engine No. 10 and its crew. (Lima 1914) at Cass. Spruce, WV. Crew Ed Lyle - fireman on far right. 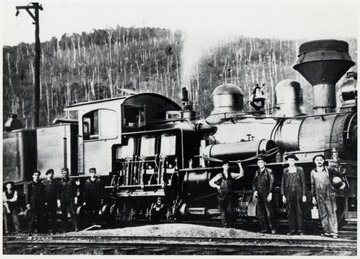 Note Lantern on Locomotive. 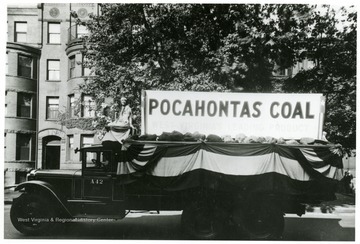 A lady dressed like Pocahontas rides on a coal truck filled with coal. 5. 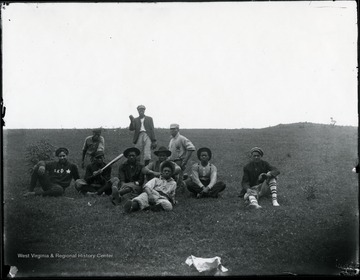 Red Star Baseball Team, Red Star, Fayette County, W. Va.
Red Star Baseball Team, Red Star, Fayette County, W. Va.
African-American baseball players of the Red Star team pose for a team photograph. 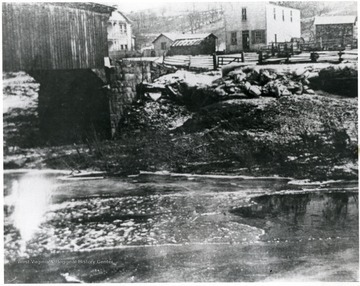 They played for a community just down Dunloup Creek from Glen Jean. 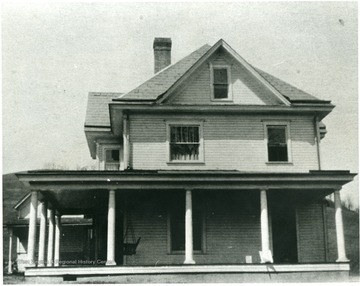 Trevey took this picture about 1915. 6. 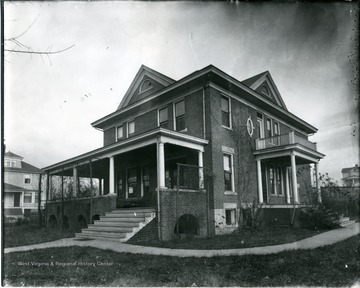 Residence on Maple Avene in Alderson, W. Va.
Residence on Maple Avene in Alderson, W. Va.
Angled view of two story Brick home. 7. Carpenters Pose After Completing a New Home in South Alderson, W. Va.
Carpenters Pose After Completing a New Home in South Alderson, W. Va.
8. Concrete Bridge Across Greenbrier River at Alderson, W. Va. 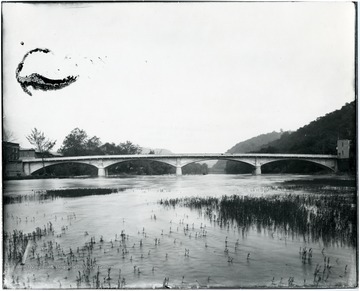 Concrete Bridge Across Greenbrier River at Alderson, W. Va.
9. Circus Caravan in Beckley, W. Va. 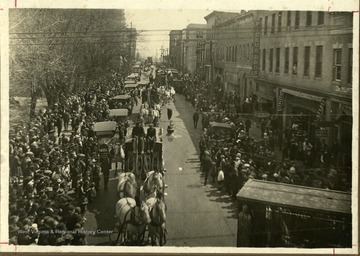 Circus Caravan in Beckley, W. Va.
Townspeople along the street watch as circus performer pass by in Beckley, West Virginia. 10. 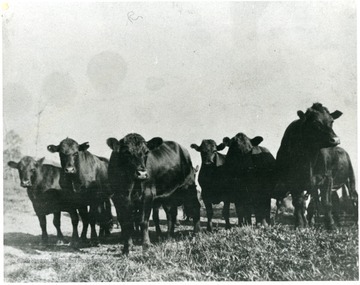 Black Angus Cattle Belonging to William Currence, Bulltown, W. Va.
Black Angus Cattle Belonging to William Currence, Bulltown, W. Va.
Close view of cows in a field. 11. 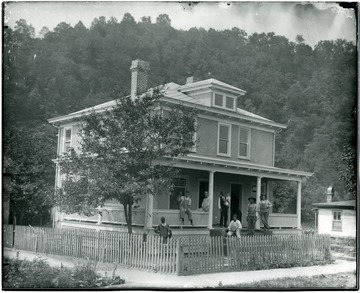 William Currence Farm at Bulltown, W. Va.
William Currence Farm at Bulltown, W. Va.
Large farmhouse on the William Currence farm. 12. Covered Bridge, Bulltown, W. Va. Covered Bridge, Bulltown, W. Va.